The annual Hunters for the Hungry program administered by the Dubois County Sportsman's Club is now complete for the 2017 year. We would like thank Ferdinand Processing, Sander Processing, Cannelburg Processing, or Ohio Valley Custom Deer Processing. In 2016 there were 119 deers donated generating over 6,100 lbs. of meat that went to feed local families. We look forward to providing more information for the 2017 season when they are available. If you would like to make a donation to our Hunters for the Hungry program to help pay for processing, you can send it to the Dubois County Sportsman’s Club at P.O. Box 304, Jasper, IN 47547-0304. Please make checks payable to: The Dubois County Sportsman’s Club and put “Hunt for the Hungry” on the memo line of the check. Any contributions are greatly appreciated! "Providing nutritious protein to food banks and hunger relief organizations within Indiana …One pound at a time…"
Thanks to the support of Sportsman’s Benevolence Fund and local community foundations, Hoosiers Feeding the Hungry will pay 100% of processing fees to area butcher shops and the meat will then be distributed to local hunger relief agencies within that community. Signing up for fishing or hunting license online or at a DNR facility? Please be sure to consider donating to the Sportsman’s Benevolence Fund to help pay processing fees for venison donated to Indiana’s food banks! The Sportsman’s Benevolence Fund pays exclusively for the processing of deer meat to feed Indiana’s hungry. 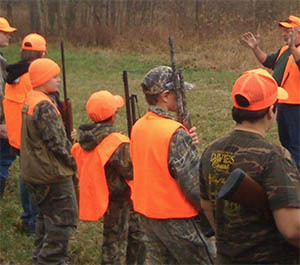 Protein sources like venison and other wild game are the most needed yet, least available food resource for food banks. The meat from one deer will provide enough for 200 meals!